Wild Splash Slip-n-Slide 0ft long Slip-n-Slide. 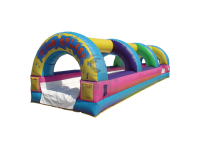 Run and dive under the soaker hoses and splash into a splash bumper at the end. This thing is freaking awesome. Kids of all ages are loving this slip-n-slide. Combine this with a bounce house or water slide and save on our multi-unit discount. Give us a call or click the Book Online button.